Even after seeing the film three times, I haven’t fully figured out why it has maintained such a hold on me, and why I’m eager to see it again. So this is why I write a blog. Under no circumstances would I want to see this movie a second time, much less a third or fourth. That a chief movie critic for the New York Times, the primary news source for the entire globe, needs to see the movie three times seriously puts at question her credibility as a film critic, and in turn the Times’ credibility. Yes, she writes well. But this is not some art house film with oblique meanings that one must read between the lines to figure out. It is utterly straightforward, and I applaud it for that. So don’t get me wrong: Boyhood is a lovely film. It does something completely unique in the history of film: present a 12-year span in the lives of several characters, filmed as it were in real-time over a period of 12 years. As such, no makeup or prosthetics or special effects are needed to show the players aging. The effects of time on the actors, and hence the characters, is by design genuine in a way unparalleled in any other movie ever made. The 12-year production combines with a very, almost too believable slice-of-life script to yield a film of quiet, steadily building power. It’s undeniably effective. But the plot could have been punched up just a bit — other than a couple less-than-ideal husbands of the mother Olivia, played by Patricia Arquette, there are no particularly upsetting events or circumstances in the lives of these characters. The boy, Mason, his sister, Samantha, and the divorced father, Mason Sr. (Ethan Hawke), are all basically good and well-adjusted folks. This works in the film’s favor, in the sense that it becomes easier to care about these people. But it also works against it by watering down a nearly 3-hour long film by denying it any great dramatic turns. Another way to put it: this movie has been hailed as an “epic.” But epic is not about length, it’s about the scope of the story. You’d have to have a very loose idea of “epic” to apply the term here. Throwing “epic” and “masterpiece” at a movie like Boyhood is the type of bluster I seek to dispel. But as I said, there is a quiet power about this movie, and it was very satisfying in this way. I was engaged for the entire length — no easy task for such a long film. But I’m not sure that a couple years from now this movie will stick with me. My enjoyment will likely end up being as transient a phenomenon as the passing days depicted in the film. I do give a lot of credit to the filmmaker Richard Linklater and the actors involved — this was something of a risky project. What if somewhere along the line one of the principal actors were not able to film that year, or worse yet, decided to opt out of the project entirely? Unless every scene had been shot with substitute actors, you’d be out of luck. Also, the younger actors might not like the idea that they would have to wait so long to receive public recognition for their work — hard to advance a career that way. Boyhood is a little like NBC’s Parenthood, if it went on for 12 years, each season presented in 15-minute segments strung together. And that gets to the heart of what I didn’t like about it. If you remove the 12-year shot from Boyhood, you would be left with something too soap-opera like, too commonplace, too so-what. Too melodramatic where a higher-caliber production would deliver that subtle, nuanced, pitch-pefect balance of drama. The entire idea of this film rests on it being shot over a period of 12 years. Not a gimmick exactly, but sort of. Let’s say a strategy, then, without which one’s left with little more than dust in the wind. I’ve made the point before that I will not award a 10/10 rating to a movie until some time has passed after watching. A 10 rating indicates not only something truly great, but a timeless film for the ages — a masterpiece. A classification not to be doled out haphazardly. Though just three months have passed since watching Under the Skin, its memory continues to pervade my consciousness. It is a haunting film that has made an indelible mark on the landscape of cinema, and a lasting impression on me. A film that I’ve not only thought about a great deal, but that has found its way into my dreams. And the time has come to award it my 10 rating. For such a short time to have passed, this is a bit of a risk for me. I would look foolish if a year or two or ten from now I reflected again on Under the Skin and felt it did not warrant a 10 rating. It is a testament to how strongly I feel about the movie that I’m placing the 10/10 label on it so soon. If you read my original review, understand that my analogy to a cross between Holy Motors and Eraserhead, though still valid, is no longer the way I would couch a discussion of Under the Skin. That was my best effort at wrapping my head around this extraordinary film, of digesting it immediately upon consumption. My understanding of the film has deepened since then, and I realize now that it demands to be dealt with strictly on its own. It is so unique that comparison to other movies is not particularly useful to gain an understanding of it, except as an academic exercise. But indulge me for a moment while I contradict myself. In a state that was half waking and half sleeping, another comparison came to me: 2001: A Space Odyssey. Based on Under the Skin, the filmmaker Jonathan Glazer has been compared by at least one critic to Stanley Kubrick. There are a couple visuals that bring to mind 2001; I cite examples below. But beyond the obvious, Under the Skin may be seen as an incredible twist on 2001, and here it is: in 2001, we had the monolith. But here, the girl is the monolith. Her body — whatever that exactly is, her charming ways, her black pool, her entire alien presence. The monolith has returned to earth, but it has folded in on itself and become this very human, and simultaneously very alien sexual being. The blackness, the void — all the abstract and mystical bounds of humanity represented by the monolith of 2001 are now embodied with this young woman. Instead of the monolith as something seen from afar, and hesitantly approached for a closer glimpse or a touch, it has now become something you enter, something that envelops you. Now mind you, I don’t believe Glazer or the novelist Michel Faber had 2001 in mind at all when composing Under the Skin. But you can tell that this movie has fired up a lot of synapses in my brain. Know too that the whole idea of an interpretation of Under the Skin as a greatly distorted retelling of 2001 is but one point of discussion, not a way to contain, define or delineate it in any way. Continued analysis, discussion and debate are often the fruits of a masterwork. This is one of those rare moments when a movie can just knock you over the head and flatten you. Under the Skin operates on different levels: as a mystery, as a tale of survival, and as an exploration of sexuality and humanity. Its profound depth is reinforced by its haunting, aptly-science fiction score and a darkened Scottish setting. Just phenomenal. With a movie this great, it doesn’t matter much to me what other critics are saying, but the high praise it has received is, I admit, reassuring. Check out the official site and its culling of criticism — what might be hyperbole for a lesser film is anything but for this one. A very beautifully photographed, but very odd film. Director was clearly a fan of Kubrick. Long, slow scenes with not much going on. Not appropriate for younger viewers and people that enjoy a faster pace. Now I normally am not interested in citing dissent, but I have a point to make. People who did not like this movie all have one thing in common: they just didn’t get it. It went way over their head. And I get that. That’s the first level I mentioned: a mystery. A mystery for the viewer to figure out. Only then do the other two levels reveal themselves — that of the survival adventure of the “lioness on the prowl”, as Scarlett Johansson put it, and then that of an exploration into human sexuality. So my point here is the fact that so many people did not like it does not indicate weakness or a lack of quality, but exactly the opposite. A lot of people will be out of their depth with Under the Skin, and will not be able to get anything out of it. As I said, I get that. I had my hands full trying to comprehend this movie as I sat through it. But if you can grasp it at all, it will stay with you. You’ll be able to attain your own ways of understanding it. And like any truly great art, its greatness will only expand from there. Lest I forget to mention, there are now iTunes Extras available when you purchase the movie from Apple — this, and the upgrade to a 10 rating, constituted my original impetus for this post before I decided I had a helluva lot more to say. The Extras are only available with the purchase (not rental) of the movie in HD ($15), and include 10 featurettes. My inclination is that if I’m going to buy this movie, I’d rather have the Blu-Ray disc. Now a check on Amazon does not mention the Extras, but I found a review of the Blu-Ray that confirms the featurettes are included. So if I decide to purchase the movie, I’ll get it on Blu-Ray, and perhaps return it if the featurettes are not there. I don’t recommend anyone purchase the movie unless they’ve already seen it. Personally, this movie is still so vividly held in my memory that I don’t feel a need to purchase it — yet. But those featurettes I am curious about, so I will probably buy it sooner than later. There is a strange space between when you leave school and when you begin work. You are idle as a painted ship upon a painted ocean. You grow restless. You cannot go back and are uncertain how to proceed. “Tiny Furniture” is about Aura, who is becalmed on that sea. It’s hard enough for a director to work with actors, but if you’re working with your own family in your own house and depicting passive aggression, selfishness and discontent and you produce a film this good, you can direct just about anybody in just about anything. First off, how does the dawn of something arrive after its rise? This title choice struck me as odd the first time it was revealed in the trailer. Third in the series? Perhaps Nascency of the Planet of the Apes… to continue in the regressive tradition. it’s a satisfying movie and an example — a dispiritingly rare one these days — of what mainstream Hollywood filmmaking can still achieve. 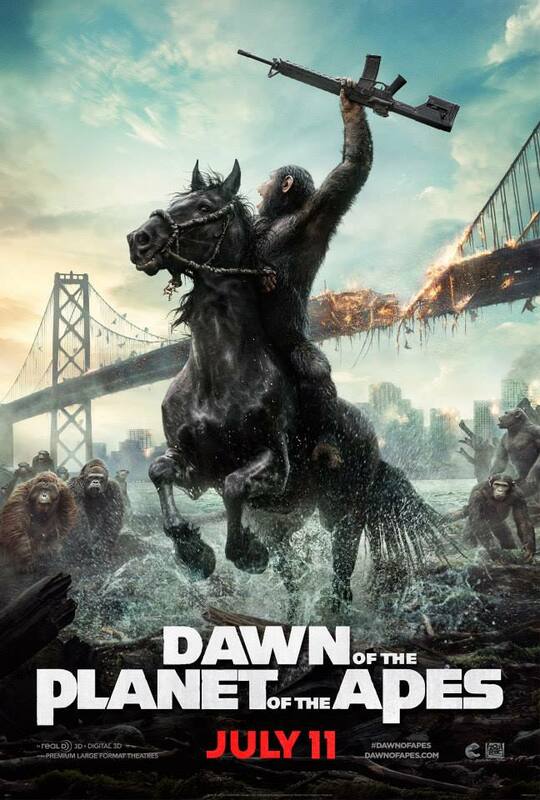 “Dawn of the Planet of the Apes” is an extremely high-functioning sci-fi thriller about extremely high-functioning apes. Some of it may seem silly in the recounting, or in the trailer, but it doesn’t feel silly in the theater. What struck me as the film progressed was that though you never forget you’re looking at apes, in all aspects of the story itself, the apes fade away. This is a story about warring tribes. I’m reminded of the comparison, as I recall, that Ebert & Siskel made of Star Wars to cowboys & indians movies — settings, technologies and characters may be different, but there are universal themes in storytelling that work well in very disparate contexts. Jenny Slate’s Donna, at the center of Obvious Child, starts out as a likable enough character that you wouldn’t mind hanging with for a while, and grows on you from there. By the end, a strong connection is established — you really like and are pulling for her. In the early going, the movie has a couple rough spots — scenes that seem a little fake, and the portrayal of Donna’s mother didn’t completely mesh. But Obvious Child is a good movie. As occurs in great movies of this type, Slate’s words flow out so naturally that it’s almost impossible to believe the entire movie was written by someone else. Another way to put it: it’s as if she’s not acting.